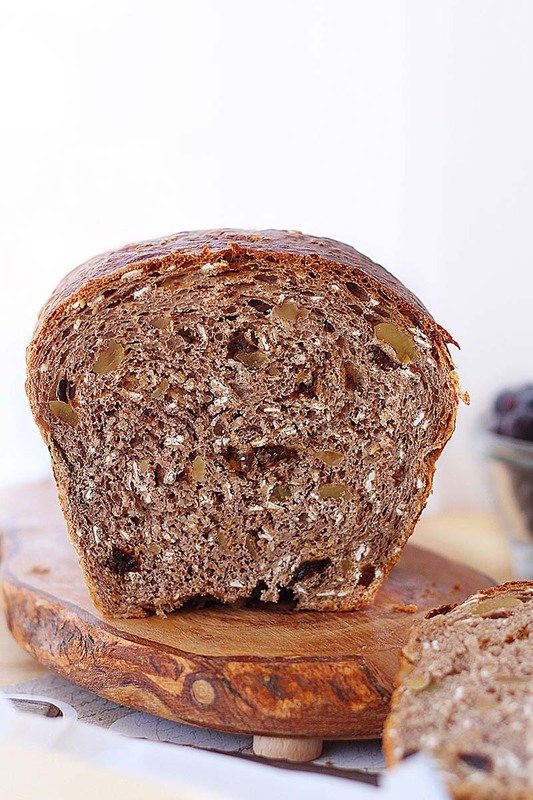 From our RED STAR Baker's Collection, Oatmeal Breakfast Bread is a family favorite from Sandra Pulido of Austin, TX. We are certain that it will become a favorite at your house, too. Have water at 80°F and all other ingredients at room temperature. Place ingredients in pan in the order specified in your owner’s manual. Select basic cycle and medium/normal crust. Pecans and raisins can be added 5 minutes before the end of the last kneading cycle. Check dough consistency after 5 minutes of kneading. The dough should be in a soft, tacky ball. If it is dry and stiff, add water, ½ to 1 tablespoon at a time. If it is too wet and sticky, add 1 tablespoon of flour at a time. See our Bread Machine section for more helpful tips and information. Hand-Held Mixer Method: Using ingredient amounts listed for medium loaf, combine yeast, 1 cup flour, cinnamon, salt and oatmeal in mixing bowl, stir to combine. Add warm water (120°-130°F), vegetable oil and maple syrup to flour mixture, mix on low speed to combine. Beat 2 to 3 minutes on medium speed. By hand, stir in pecans, raisins, and enough remaining flour to make a soft dough. Knead on floured surface 5 to 7 minutes or until smooth and elastic. Use additional flour if necessary. Stand Mixer Method: Using ingredient amounts listed for medium loaf, combine yeast, 1 cup flour, cinnamon, salt and oatmeal in mixing bowl, stir to combine. Add warm water (120°-130°F), vegetable oil and maple syrup to flour mixture; mix with paddle or beaters for 4 minutes on medium speed. Gradually add remaining flour and knead with dough hook(s) 5 to 7 minutes until smooth and elastic. Food Processor Method: Using ingredient amounts listed for medium loaf, combine yeast, 1 cup flour, cinnamon, salt and oatmeal in processing bowl with steel blade. While motor is running, add warm water, vegetable oil and maple syrup to flour mixture; process until mixed. Continue processing, adding remaining flour until dough forms a ball. Add pecans and raisins; pulse just until mixed. Place dough in lightly oiled bowl and turn to grease top. Cover; let rise until dough tests [url:4]ripe[/url, about an hour]. Turn dough onto lightly floured surface; punch down to remove air bubbles. Roll or pat into a 14x7- inch rectangle. Starting with shorter side, roll up tightly, pressing dough into roll. Pinch edges and taper ends to seal. Place on 9x5-inch loaf pan. Cover; let rise until indentation remains after touching, about 30 minutes. Bake in preheated 375°F oven 30 to 40 minutes. Remove from pan; cool on wire rack. This is my perfect bread: cinnamon, pecans, oatmeal and raisins. However, this being the 2nd or 3rd time I’ve made it, I just couldn’t resist tossing in some chopped crystallized ginger along with the raisins and pecans. Now my husband can’t stop eating it! I made it in a stand mixer but added nuts & fruit by hand since it’s a lot to work in. It is definitely worth the effort and not only tastes amazing but smells wonderful too. I have made this bread three times (3 weekends in a row). It is a very good recipe – healthy and nutritious. I analyzed the recipe on a calorie counter website and it rates a A- grade. The minus is because of the maple syrup. (I used pure maple syrup. I did not know if the pancake maple syrup would work.) I slice a piece off and have it with my coffee in the morning and off to work I go. I usually don’t get hungry until close to lunch time. It fits right into my planned calorie intake each day!